If I had not to attend an advisory board meeting, I probably would not have been going. But I am German, I am on duty. I am a librarian, I feel committed. If I would not attend, the world would probably collapse. So in the end, I booked a short trip of three days for both, meeting and conference. That should be more than enough, I thought. Going to EAHIL conferences is so comfortable. They have always the same good old schedule, which let you not miss anything. In contrary, the Boston conference overwhelmed me even before it started. Long before I was buried by emails, sometimes 20 per day or more. After a short while I suffered from information overload and gave up to understand what it was all about. Almost desperately, I booked two courses on tablet PCs in advance, the Welcome Reception and the “25th annual YBP Health Walk”, so as not to waste my time. I had no clue about the walk, but at 6:30 in the morning it seemed to be a nice activity before breakfast. Once being on the road, my fears vanished like snow in the sun. The flight was fortunately long enough to watch “The Hobbit” and “Django Unchained”, two movies which I longed to see but had missed before. The plane was not fully booked so I had a whole row to my own. The receptionist at the Hilton gave my a nice room and the board meeting started in a restaurant nearby. Mostly, companies make use of library advisory boards to get sound feedback, to enhance their image and to influence the profession. At the boards of Nature, UpToDate, NEJM, Thomson Reuters or Wiley (to name just a few) usually you find a bunch of well known and reputed librarians from around the world, with a focus on the USA. It is always a pleasure and inspiring to discuss matters with these people. And it is highly rewarding, if the company really listens to you and change their product accordingly (but certainly not their price). Since technology is constantly changing, we update the class right up until we teach it! We’d like to ask you all a few questions to help us finalize our agenda for the class. Feel free to bring any device you might have to the class (smartphone, tablet, e-book reader, etc.) especially if you have questions about them. See you soon in Boston! In the afternoon I enjoyed the welcome reception and the huge exhibition of hundreds of vendors. For the first time I met Peter Stadler from Unbound Medicine, who helped me to start our handheld project ten years ago. There was a booth from the Cochrane Library too, where you could learn about their new App, and one of the National Library of Medicine, where you could complain about the PubMed interface. All in all, it was the most comprehensive exhibition of library vendors I may have seen in my lifetime. That evening, Elsevier invited for the ClinicalKey Party. Usually I would not miss any opportunity for dancing, but two things held me back this time: I recently ruptured my achilles tendon by foolishly playing basketball, and secondly, I held on to the German time to avoid jetlag, which forced me to sleep between 9pm and 3am. The conference started on Sunday, May 5th, with a keynote speech by Dr. Richard Besser, medical TV expert and former CDC director. He told us stories about his fight against SARS, why he quit CDC and moved to ABC News and why he prefers storytelling to Powerpoint. 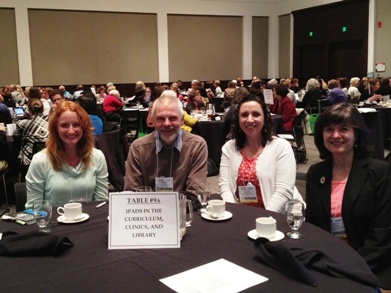 The speech was followed by a Chapter Council Roundtables Luncheon on “iPads in the curriculum, clinics, and library”. The topic seriously caught my attention, but I was not sure what to expect. It turns out, that we all were seated at 20 to 30 roundtables, that lunch was served, but there was no lecturing going on. Instead on each table there was an iPad expert facilitating the discussion. Luckily I found myself on a table with three very knowledgeable librarians using iPads in diverse settings such as clinical rounds, library instruction, accessing information and circulating them of course. Almost instantly, a vivid discussion started on everything from Apps to Cats. Dr. Besser’s kind of presenting was a hot topic too. So we asked our facilitator (who, by coincidence, was organizing next year’s conference at Chicago) to provide a course on storytelling and critical thinking there. I can profess that I never had a similar encouraging discussion. These two hours alone would have been enough to justify my trip. In the afternoon, Jaime Blanck, Clinical Informationist from William H. Welch Medical Library at Johns Hopkins University, delivered an amazing overview on their closing their library’s doors (see the interview with Nancy Roderer): “The Library Without Walls: How We Moved Out of the Welch Library Building and Continued to Improve Our Services”. I was surprised to learn that Nancy quit their job as a director just after the closing, but Jaime reassured me, that this was accidentally. When I left the conference on Sunday evening, my bag was full of ideas and impressions and the longing to have stayed some more days and at least to accomplish the YBP Health Walk. This report was published in the June issue 2013 of JEAHIL.